If you live in Stoke-on-Trent or the surrounding Staffordshire area and you are thinking of selling your car, then you are able to get an instant online car valuation today from Money4yourMotors.com. Our mobile purchasing units are nationwide and we have purchasers situated in the Stoke-on-Trent area who will visit you at your home address to assess your vehicle. 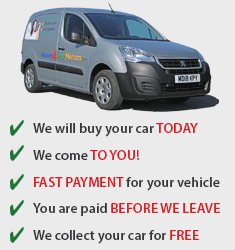 In addition to visiting you at your home address if you decide to sell your car to us then we will pay you by instant bank transfer and you will be able to confirm the money is in your bank account before our vehicle purchaser leaves for their next appointment in Staffordshire. A city located in the Midlands in Staffordshire, Stoke-on-Trent is known as the home of the pottery industry and is also commonly known as 'The Potteries'. The city has given the world many things from pottery and the Supermarine Spitfire to the spark plug and Robbie Williams. A trip to the Gladstone Pottery Museum is worthwhile to learn all about the city's rich pottery heritage. The museum itself dates back to the 18th Century; this building alone is something to see. Stoke-on-Trent has many family-friendly activities to choose from including Water World - a tropical-themed water park with waves and slides, there's also the Trentham Monkey Forest which houses over 140 monkeys and, of course, the city is home to the famous theme park, Alton Towers Resort.